(Newser) – Forget technical difficulties: It's politics that have posed a problem in Endeavour's last journey. 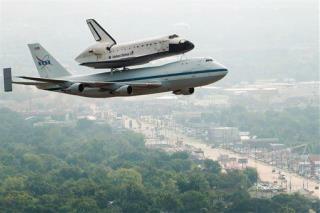 The space shuttle has been soaring across the US in celebration of its 20 years and 122,883,151 miles. But the last 12 miles of its journey—through south Los Angeles on a 160-wheel carrier—are proving the toughest. That's because in order to move the hulking shuttle through the area (at 2mph), 400 trees had to be removed; they're a precious resource in the area, the New York Times reports. Has anyone seen the trees that were cut down? Has anyone looked at the condition of the sidewalks and streets that will be affected? LA hasn't been doing any maintenance for years under the existing, incompetent administration. If this gives some civic improvement to South Central I say Booyah! ...or you could have just given the shuttle to Houston like you should have done in the first place. Just sayin'. It's a good deal for everyone. That 2 miles of road will be much better off. New road, sidewalks, 4X the trees. I am personally going to be at Moffet Field tomorrow morning to see the fly-by there. Been a HUGE NASA fan since day 1.